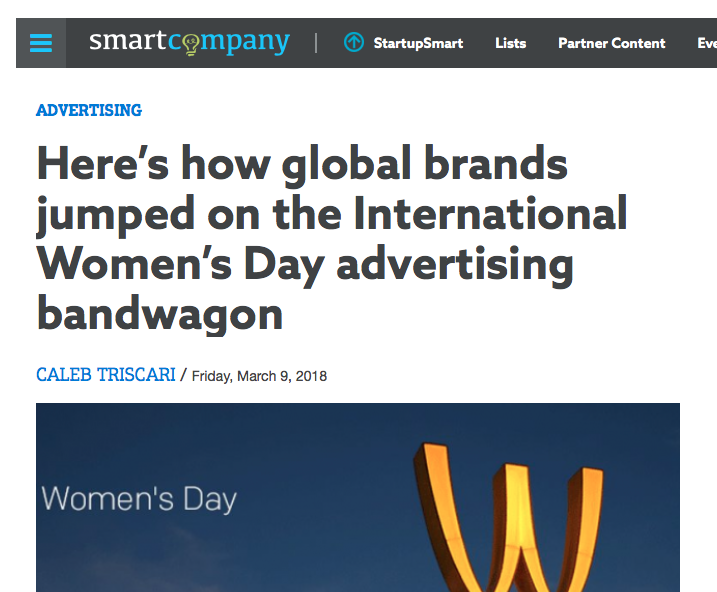 This article detailed multiple examples of how brands leveraged International Women’s Day to show their support of women. Bec Brideson comments below only but to read the full article, click here. “Bec Brideson, gender-intelligence consultant, tells SmartCompany a one-off campaign from brands can be interpreted as tokenistic, if it’s not executed well. “I won’t balk at any movement that starts a conversation about the value of women, I welcome it,” she says. In the case of McDonald’s, Brideson says producing a one-off marketing campaign doesn’t cut it anymore in an environment where consumers can easily research the history of a company. “This year, McDonald’s flipping their golden arches to make a W feels like a similar version of ‘McFemvertising’, when facts about pay inequality, zero-hour contracts and little wages start to surface,” she says. Brideson says the success of campaigns also rests on how companies actually act, beyond the values they say they support in an ad campaign. If brands wish to deliver an effective campaign that does not come off as tokenistic, Brideson recommends a campaign that is long-term and central to the business’ ethos.